Never forget to keep it real! For riders looking for the best braking performance that money can buy, only one option for brake lines truely exists. Goodridge, Inc. makes teflon lines with plastic coated stainless braiding provided for maximum protection. The line fittings provide for custom lengths and ends. This is a very high quality aircraft grade system scaled down for bicycle use. The only penalties of the system are weight and cost. They are very slightly heavier than stock shimano lines, and the retail cost is around $70 per wheel. The real difference the rider will find when using these lines is that they are extremely difficult to kink. If you crash a lot, you know how important this feature is. Significant performance improvements can be made by replacing stock bearing cartriges or loose bearing packs with ceramic hybrid bearing cartriges or loose ceramic bearings. It is important to use quality bearings in this case. Boca Bearing has a selection of ceramic bearings for sale online. I know nothing of the quality of these bearings, but they are readily available. Dupont Krytox GPL 20X is a very high quality synthetic bearing grease. I am not sure of the exact grade for bicycle use, but do know that skateboards would use GPL 201. A sealed and greased bearing is prefered to one that is oiled due to the fact that skateboarders simply do not clean and re-lube at intervals even close to necessary for oil use. A greased bearing is basically maintanance free, but can be cleaned and relubed if need be. See SKF's site HERE for cleaning details. The bearing cartridge is not to be packed full of grease, only enough to coat the actual balls (30% of open space). To much grease causes unnecessary friction. NTN has an excellent artical on bearing lubrication HERE and another artical on care and failure analisis HERE . A petroleum mineral base oil (Lithium soap petroleum greases) should be selected due to the higher film strength that these oils have over synthetic. Cheveron SRI is considered the standard bearing grease for general use. SKF Grease LGLT 2 considered the standard bearing grease for high speed, low temp use. This is some expensive stuff. Maintanance Products Direct caries it and it sells for $21 per 0.2 kg. Dow Corning MolyKote BG555 Low Noise Grease is very similar as is Kyodo Yushi Multemp SRL and MobilGrease 27. Some really great synthetic bearing greases are on the market today. Dupont Krytox GPL 20X is some really killer stuff. Interesting note, Phil Wood grease is actually Drydene #4000 Lubricant by Dryden Oil Company (now castrol? ), a marine grade grease. I am looking into whether Pennzoil Marine grease crosses over well. This is THE way to have a hot bike and save money. LX performs great, costs little and lasts too. 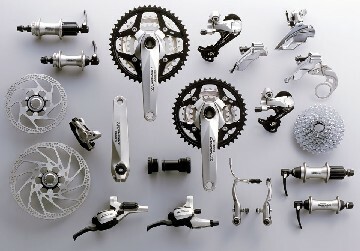 The fact that it got a facelift for 2005 means that you will have total integration with other Shimano parts your running plus, saving money on many parts. Spending money on XTR or even XT is getting foolish. See an artical on these parts HERE & HERE. A description on the new Fox 2005 models is available HERE. Certainly the Talas RLC, Factory Downhill Fork, the 36, and the DHX 5.0 are the stars of the show. Almost nobody is using the Vanilla fork anymore, the Talas is lighter and actually performs far better in all aggressive situations. I have a propedal triad shock currently on my 2004 Specialized Stumpjumper 100. The propedal is very nice, but is set up way too firm. 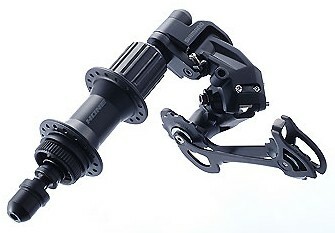 The DHX solves this by adding adjustable propedal and adjustable bottoming resistance. I can't wait to ride this shock. Let's see if it comes on the 2005 Specialized Enduro. The new Enduro is going to be a 30 lb. six and six bike with a Fox 36 on the front. The 2005 Specialized Stumpjumper 120 is probably the nicest bikes available today for honest trail riding. One thing that Fox does need to add is a way to rapidly turn the propedal on/off at the handlebars. This would be the ultimate trail riding feature. I am so sick of Sidi shoes. I've burned though about 6 pair over the years. They feel good to start, but later sag and fall apart. When your paying around $200 for a set of shoes, I expect more. I tried some cheaper shoes that sucked and fell apart even quicker. But now I've found a better shoe. Specialized Comp Mountain Shoe (Sz 43). No Stupid buckle to break. Better foot protection. Stiff Sole. Fit is great and even better with a Superfeet insole. Priced at $99. Who could ask for anything more. Sometimes it is difficult to find exactly what you need. 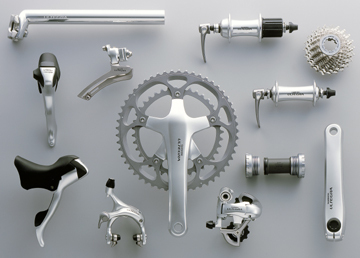 Some online retailers are specialists in providing a vast selection of tools, supplies and parts for the bicycle mechanic. Best Race EVER! Back in 2005. Check HERE. Course record Mark Weir 00:39:48.87. Mark is one of the best all around riders out there and he loves this race!! www.BikeGuide.org - Sheepdog is not your average BMX rider or common cycleist. He's a thinker, be sure to read his stuff. http://search.bikelist.org/ - INFO for sure. Sheldon Brown - The man. One of the best places to get information and discuss topics is online. * Fox has abandoned the motorcycle market. They had been making a basically competent shocks. The devastating superiority of Penske and Ohlins must have had something to do with this. * Progressive Suspension has made low grade replacement parts for cruiser motorcycle for years, never having a competative product for either superbike or supercross. * Showa, with Honda's recent arrival, Showa will not be far off. Showa tried the bike market in the early nineties (Trek Forks) but were too proud to continue making forks for a market that did not want suspension forks to actually move. If Showa gets serious about bicycle forks, everyone else will cry at their feet. * Manatou. This company is schitso for sure. They either make the lowest cost, lamest crap or they make a surprisingly competitive racing product. Hope you get lucky. * Hayes has long been renouned for producing the worst brakes in the motorcycle business. They have now brought that talent to the bicycle business. If you beleive that the information that I have presented here is not correct, is unclear, or need further elaboration, please e-mail me: pvd@peterverdonedesigns.com. I am happy to make this site more accurate, error free, and useful. Please see the RESUME section for more information.